In the heart of the city, we expect to encounter lawyers, investment bankers, accountants, advertising executives, and consultants of all stripes. Those are the people who occupy the tall glimmering boxes that have replaced much of the old. Those are the people who think daily about money, strategy, and other intangibles. As of late, that cadre of professionals has expanded to include software engineers. In days long past, they wore wing-tips, high heels, and grey or blue suits, but now it is business casual everyday--not just on Fridays. Long ago, there were machine shops and other light manufacturing firms, but even then only on the periphery. Those operations are long gone, as are the Union Stockyards, steel plants, and heavy manufacturing operations that once comprised Chicago's industrial economy. Yes, Boeing is headquartered beside the river, but no planes are built here. 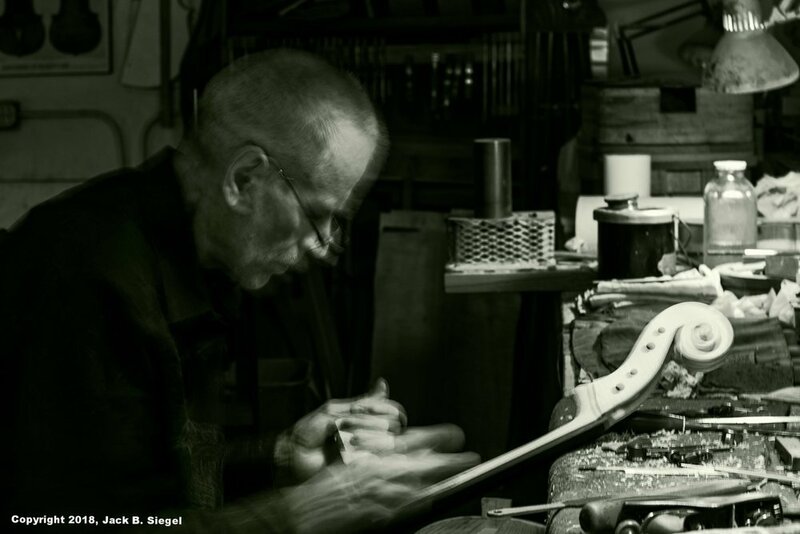 Yet, if you are willing to look deep into the Fine Arts Building on the southend of Michigan Avenue, you will find artisans and craftsmen at work, eschewing robotics and AI in favor of age-old techniques. Take the gated, man-operated elevator to the fifth floor. Step off into the dimly lit hallway. 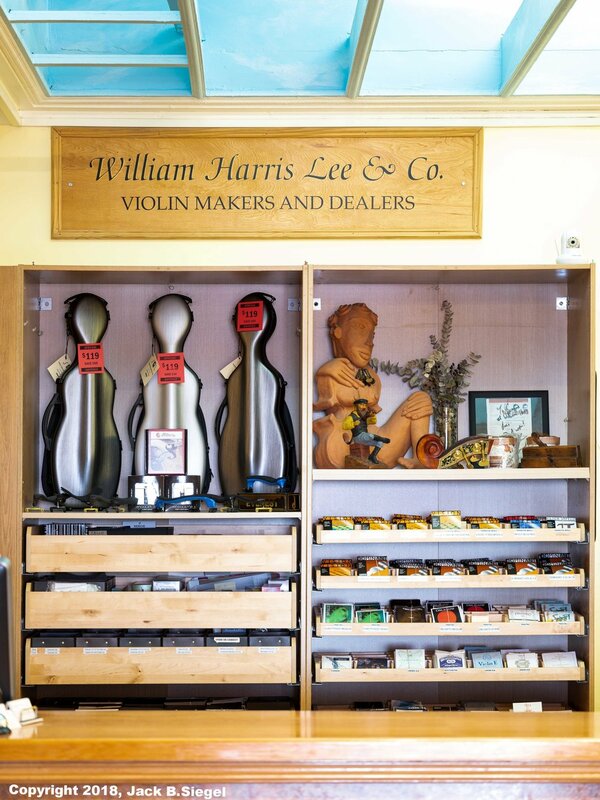 To your right is William Harris Lee & Company, a firm that is celebrating its fourth decade in business this year. 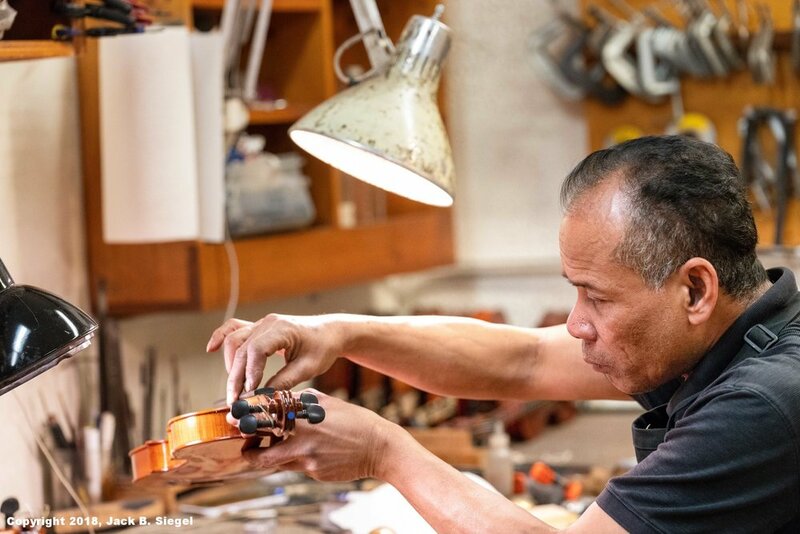 At its essence, William Harris Lee is a luthier--a maker of string instruments such as cellos and violins. Upon entering, the first thing you see is the sales counter. To your right, is a large sunlit performance space. Diffused lights filters through the dirt-streaked bay windows. 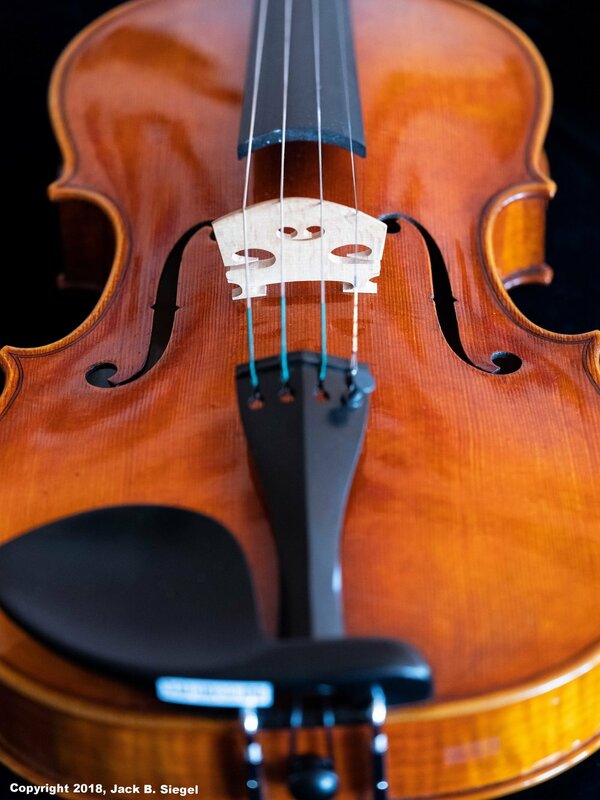 Highly polished cellos, violins, and violas sit against the walls and on the black-felt covering a table. At the front window sits an old Steinway. Before you reach the sales counter, your eye is drawn toward the back of the space, down a long narrow hallway. 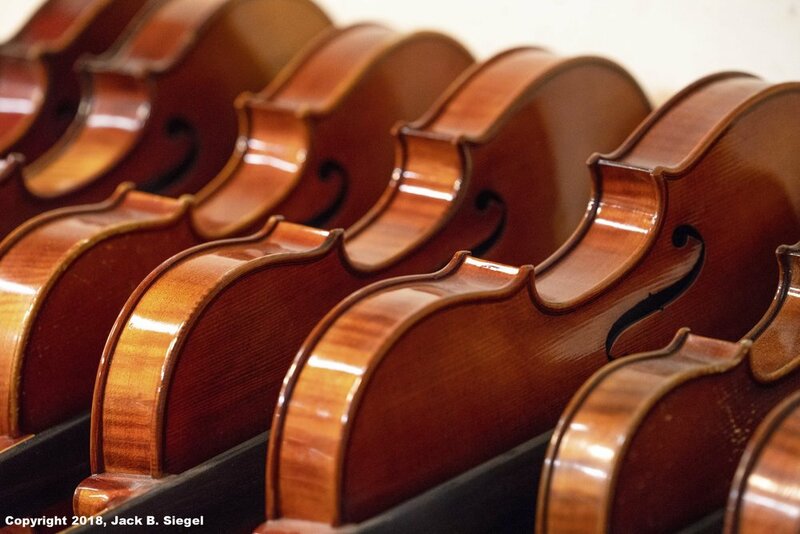 Follow it, and first you see violins on shelves to your right. To your left, are large windows looking across a narrow courtyard toward black-stained bricks that make up another portion of the building. 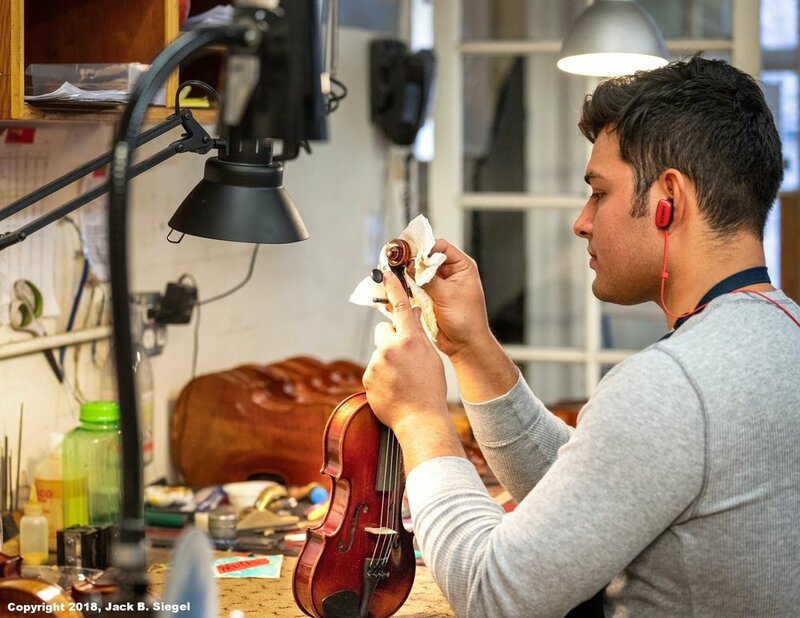 Past the shelves of violins, you arrive at the three or four workshop spaces, with a visible workforce of six or seven artisans. It is very quiet. 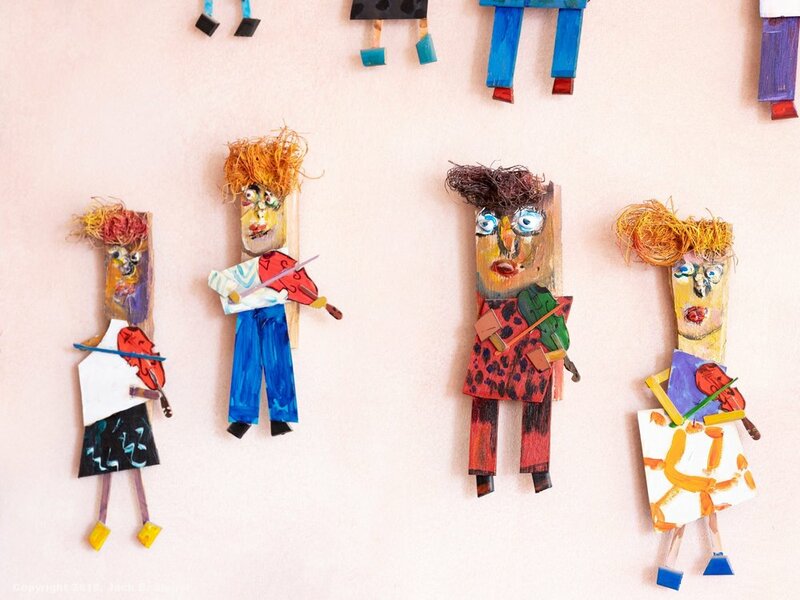 The walls are lined with calendars and pictures of instruments. 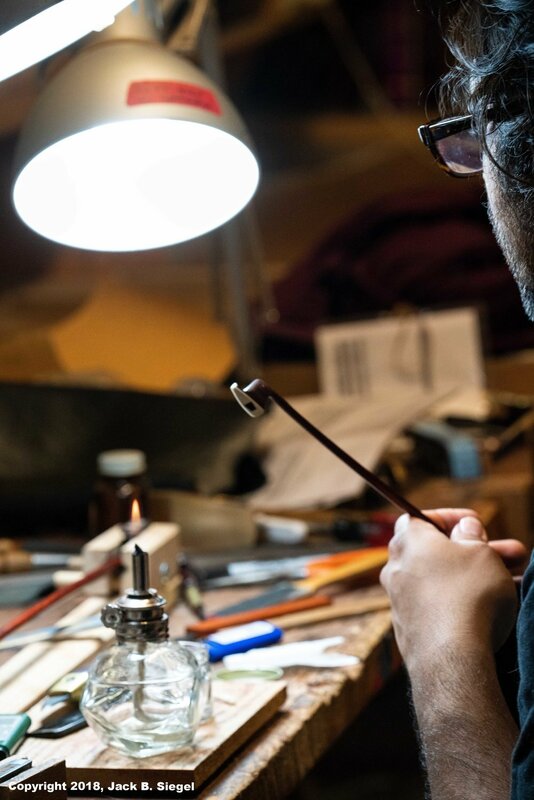 There are no computers or monitors, although several of the artisans have the latest in earbuds attached to iPhones or iPod devices. Do you think these folks are listening to classical music, jazz or the Hollywood Strings? The craftsmen are concentrating on the work at hand. One gentlemen is planing the wood that will be the back of a violin. 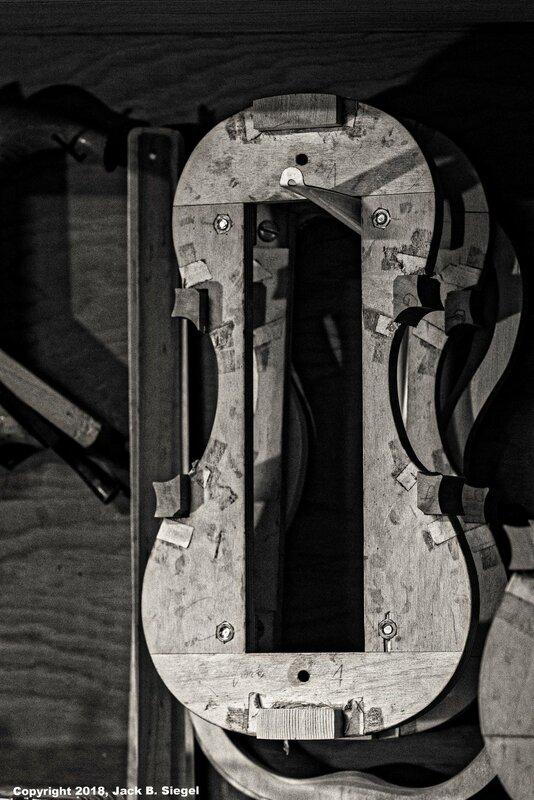 Another checks the fit of the neck to the body of a cello. 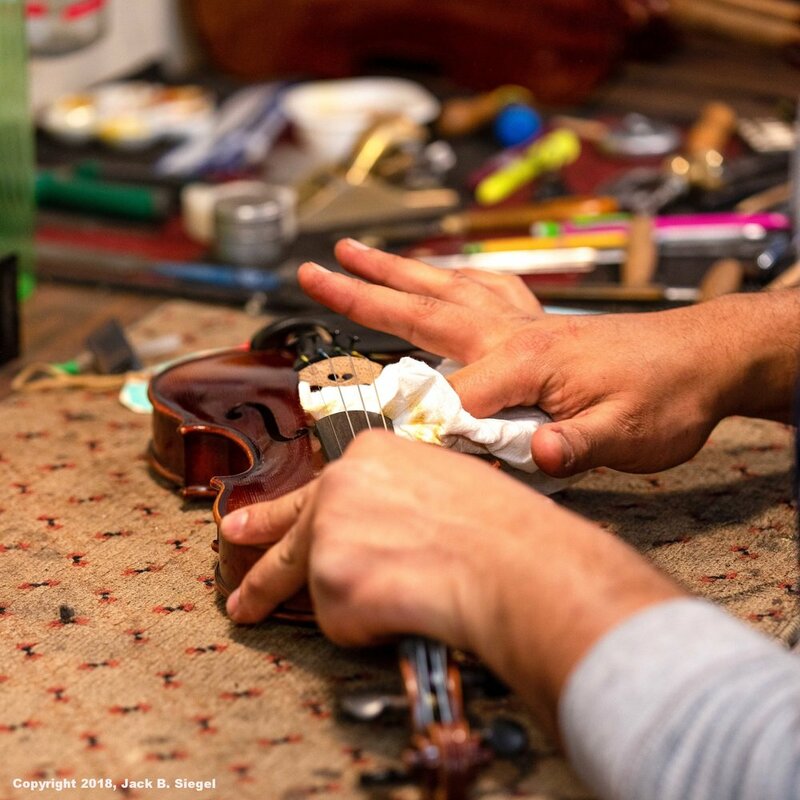 He then picks up a tool to make one of many microscopic adjustments that he will make before a freshly-minted cello is ready for the skilled hands of a musician. 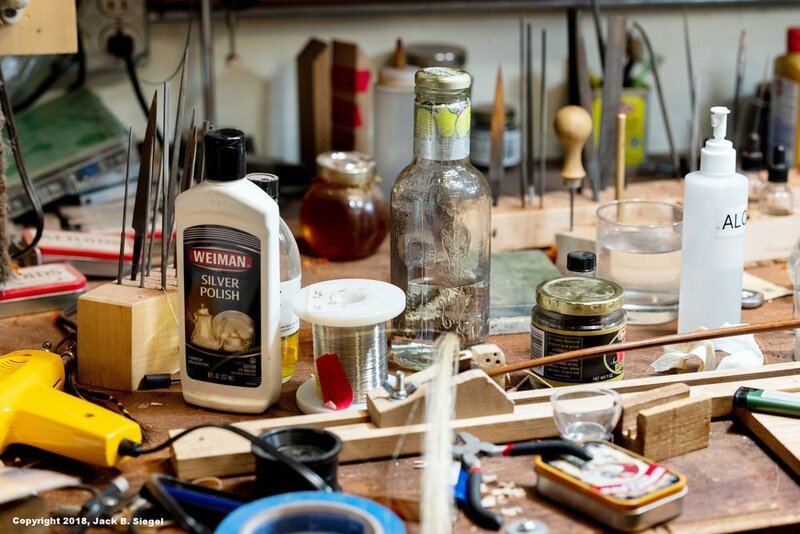 At another workbench an artisan with a man-bun constructs bows. Over the course of 45 minutes, he pulls white horse hair from a spindle-like device; uses a Q-tip to polish the tip of a bow; passes part of a bow over a small flame emitted from an oval-shaped vessel holding alcohol; and makes assorted other adjustments to the parts that comprise the bow. 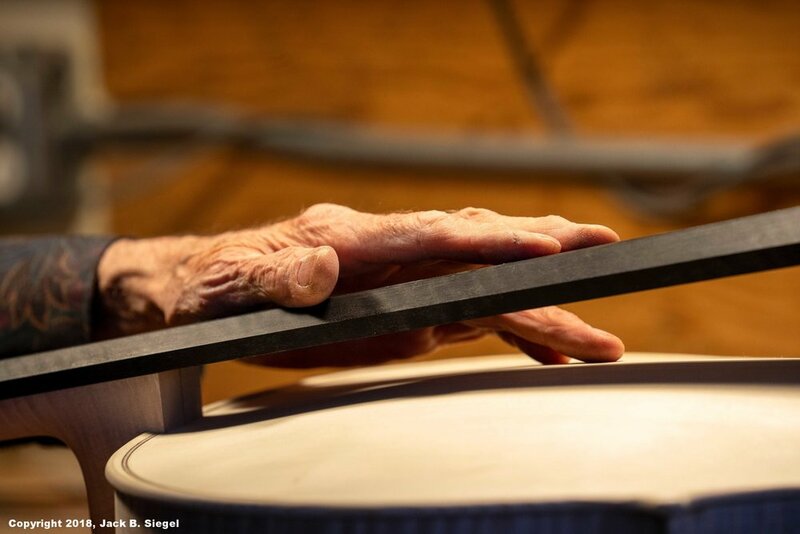 Anywhere from 200 to 400 hours of labor goes into creating one of the instruments created in this internationally renowned workshop. 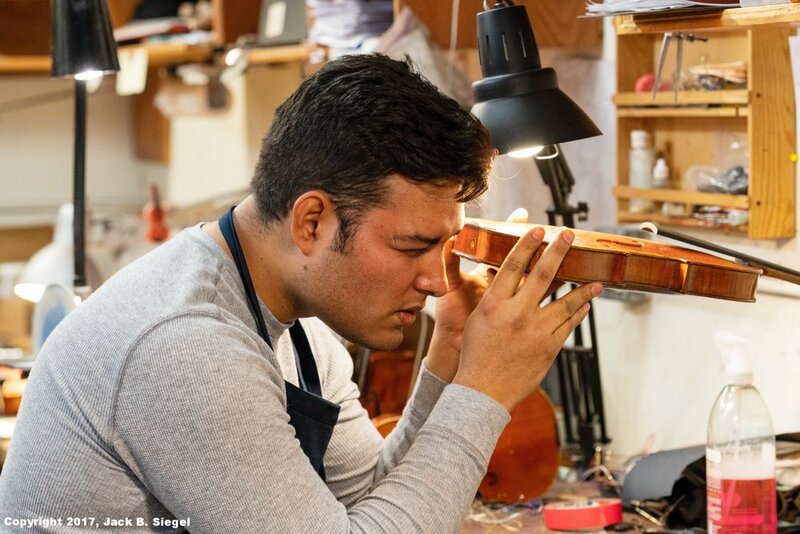 Not surprisingly, the Chicago Symphony is one of the shop's customers, but so are many musicians in Europe. I imagine the artisans take much satisfaction from their efforts. No doubt this is a so-called 10,000-hour profession, and I would be willing to bet the number for is closer to 20,000. As I left, a young woman was in the studio space playing a cello. Apparently it needed repairs, but it sounded just as rich as the varnish covering it. 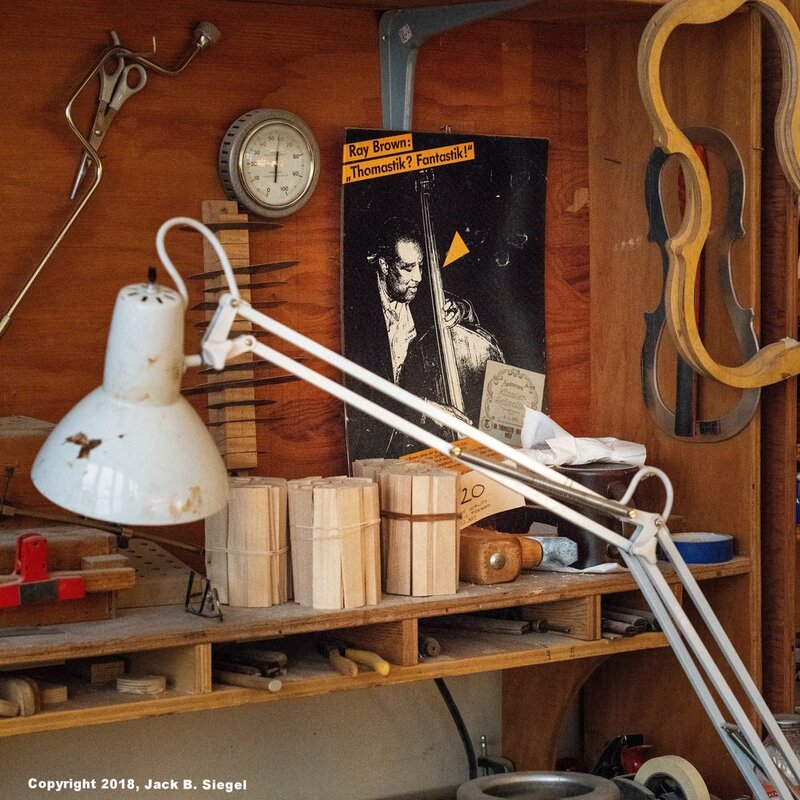 Form exceeds function when the instrument comes from this workshop. Photographer's Notes: The vast majority of the photographs in this series were made using a Sony A7Riii, with a Sony G Master 70-200mm lens attached. As has been the case, the new Sony camera body continues to perform exceptionally at high ISOs. Several of the photographs in this series were made at ISO 6,400 and 12,800. No noise reduction has been applied. I only had two hours to make these photographs. I would love to go back. It would be easy to spend 10 hours in the workshop. By way of example, I brought a macro lens, but never used it. There were plenty of opportunities for macro photography.